Goulburn Boomerang Bags member Heather West is an environmentalist putting her love of sewing to use to help provide an alternative to plastic shopping bags. Photos: Maryann Weston. With Australians using around five billion plastic bags annually and less than 4 per cent recycled, Goulburn’s Boomerang Bags is doing its bit to save the environment – one bag at a time. The Goulburn group is part of a national grassroots, environmental movement that sews and distributes material bags as an alternative to plastic bags. So far, it’s handed out about 400 this year, and 500 in 2017. Boomerang Bags in Australia was founded in 2013 by two mums Tania Potts and Jordyn de-Boer who were concerned about plastic pollution. Today, around 750 communities have taken up the environmental cause. At the same time, the major supermarket chains are responding to consumer and government pressure and phasing out single-use plastic bags. Plastic bags take between 15 and 1000 years to break down in the environment. Approximately 30-50 million plastic bags end up on our beaches, street and in our parks, according to Planet Ark. The Boomerang Bags movement, which has grown largely through word of mouth, aims to raise awareness of the environmental cost of plastic bags. Groups meet and sew and distribute material bags within their communities. “We meet on the last Sunday of the month at WorkSpace2580 for about 3-4 hours. 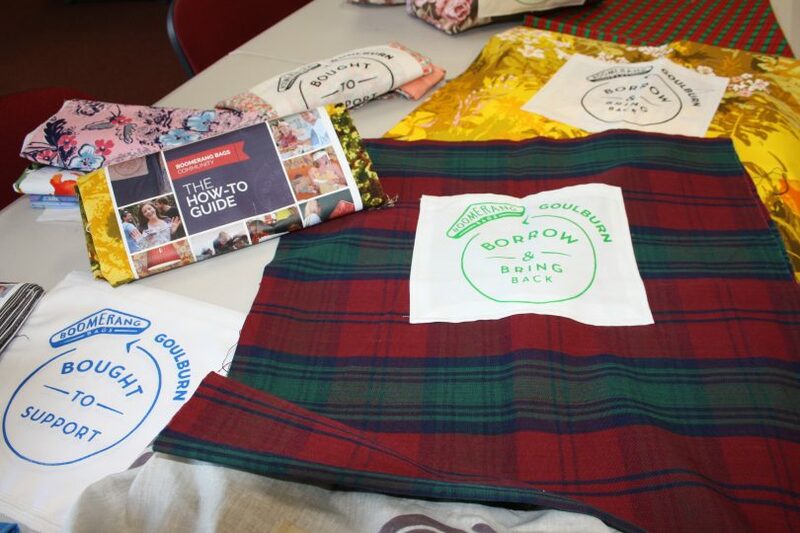 It’s a social time; some trace the bag patterns on the fabric, some cut out the patterns, some press the bag handles, and others sew,” Goulburn Boomerang Bags member and former teacher Heather West said. Most bags are given away to the general public or a gold coin donation is taken which goes towards the cost of thread. Around 30 members have joined the Goulburn branch of Boomerang Bags. For Heather, a quilter, the drawcard was the chance to help the environment, and sew. “As I’m sewing it makes me think a lot about my era. We took our lunch to school in brown paper bags; we folded the grease-proof paper and reused it. Every house only had a small garbage tin. Now we have huge Otto bins,” Heather said. The social aspect of Boomerang Bags was also a motivator for Heather. 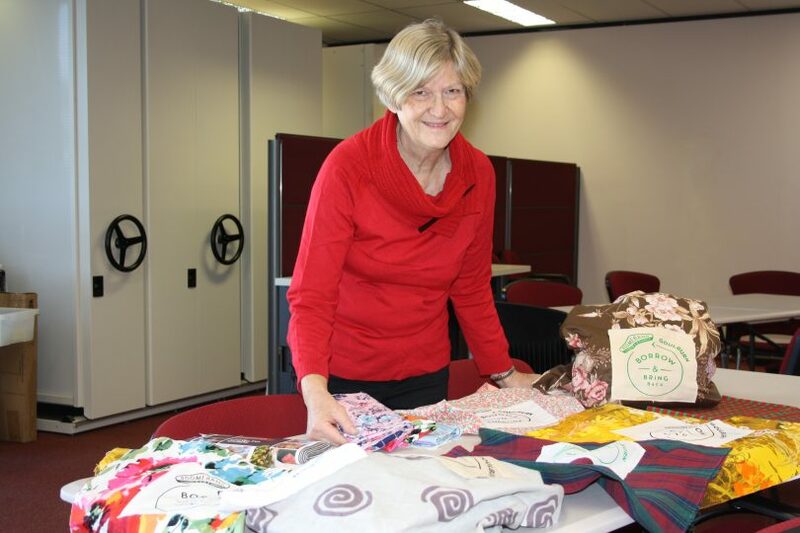 Local schools, disability groups and the Goulburn hospital have also contributed to or participated in Boomerang Bags, using its pattern, joining in the monthly meetings or donating long forgotten, stored fabric. Anybody can join Boomerang Bags, whether that is helping to cut out patterns or donating material. “You can find our local Boomerang Bags at festivals in the region, or at WorkSpace2580. If any shop owners want to stock our bags, we are happy to supply them,” Heather said. For Boomerang Bags co-founder Tania Potts, the Goulburn group is typical of the enthusiasm found in Boomerang Bag communities across Australia. “We have grown organically and no money has been spent marketing Boomerang Bags in Australia. It’s been word of mouth because people recognise that as a society, we are really struggling with plastic bags,” Tania said. Since 2014, Boomerang Bags has handmade more than 50,000 reusable bags, replaced 25 million plastic bags, and diverted over 8000 kg of waste from landfill. Nationally, the organisation takes an average of around 10 new registrations a day, as communities come on board to start their own groups. It’s also an international movement with groups in New Zealand and other countries such as Canada and the US. “It was a simple idea but it educates and raises awareness of what plastics do to our oceans and our landfills. Landfills once lasted 15 years; they’re now only lasting 3-4 years,” Tania said. “And awareness of plastic pollution is becoming mainstream. You only need to walk on our beaches to see the rubbish. We have very passionate people joining Boomerang Bags from remote towns in Australia that have no recycling but say they can do something for the environment; they can make bags. You can find out more about Boomerang Bags Goulburn here, and for more information about the national movement, visit Facebook.